Happy (not Saturday) Monday! and Happy St. Patrick’s Day (if you’re Irish or otherwise celebrate the day) and Happy Green Birds of California Day (if you’re a slightly crazed poet…)! I missed my chance to post my prompt on Saturday, and yesterday I spent the day outdoors in the sunshine and prepping for today’s poetry teaching start at a local elementary school. Now, three cups of tea later, I’m finally recovered enough think of a prompt and write a poem to go with it. Fortunately for me, one of my favorite blogs, Audublog, affiliated with Audubon California, has provided me with this fabulous post about green birds of California to get me (and all of us) started. Let’s think of a poem today as something you can write that surprises you. Something you write in your own unique voice, without cliches. If you think of a green bird, you might visualize a bird you’re familiar with: a Mallard duck, an Anna’s hummingbird. And you could write a perfectly good poem about one of those. But what about the Violet-green swallow? Or the even less likely Ruby-crowned kinglet? Who names a green bird “ruby-crowned”?? I think my favorite green bird from this post is the Hutton’s vireo. I wonder who Hutton was? And why he named this sweet little fellow with the multicolored striped wings after himself? One of my favorite bird poets writing today is Mary Oliver, who has written scads of poems about egrets, owls, hummers. Another favorite poet, Brenda Hillman, also writes about birds — they pop up in her strange and prickly poetry where least expected. 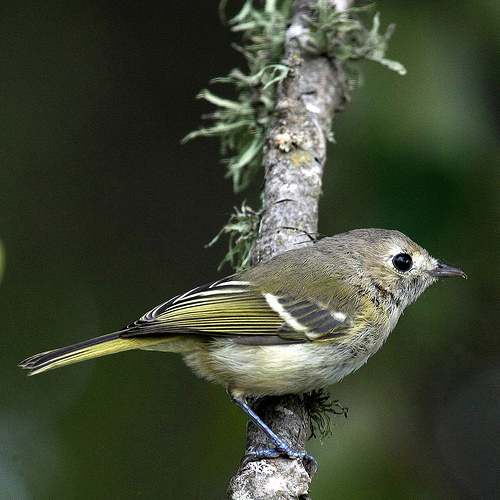 I couldn’t find any poems about the Hutton’s vireo, but I did find a great website that helps the birder differentiate one from a ruby-crowned kinglet — filled with great descriptions of their wings, head shape, and their songs. How is this for a delightful description of sounds that can’t be written down? Voice is a much better character and is diagnostic once learned. The oft-heard, soft rattle of the kinglet is a dominant sound in wintering mixed flocks; it has been described as a scolding “je-dit, je-dit,” or “chiditdit” or a machine-gun “ah-a-a-a-a-a-a,” but it is not the least bit whinny. The vireo gives a typical vireo scold, a whinny descending “whee-we-we-we,” a nasal descending “cheee,” or may sing its two-part monotonous upslurred “zuwee” or “chew-wheet” song on warm days at any time of year (sometimes a downslurred “zeeoo…zeeoo….zeeoo.” In coastal California, serious singing by the vireo often begins in February when there are still a lot of kinglet around. Your challenge for this week is to write a poem about a green bird. Investigate the Audublog, or look out your window and see what’s in your garden. Take a walk to a local pond and check out the ducks. Listen to the birds. Write down what they sound like. And then imagine that you can understand their songs — that would make a poem worthy of spring.